The corners of the case boast extra padding that'll hopefully help to protect against a cracked display if I ever suffer a case of the butterfingers. With the Metropolis's textured back plate, that's not likely to happen: it provides lots of options for a set of fingers looking to get a grip. There's a place to store a Surface Pen baked into the top edge of the case and a wee elastic stay to keep the Surface's keyboard cover in place when it's closed. If you prefer to roll without a keyboard, the Metropolis also comes with an insert that can be used to protect the bottom of the tablet where the keyboard connects to. Now here come the compromises. First, at 10.2 ounces, this is a frigging heavy case. Given that the Surface Go itself weighs 18.4 ounces, I had to really search my soul for the answer of whether or not I want to use the Metropolis at all. I decided that when I'm at home or headed to a coffee shop, I'd leave the case in a drawer. The risk of damaging my tablet versus the substantial weight that it adds doesn't feel worthwhile. That said, when I'm traveling to ill-advised locals or using my Surface to record data while I'm doing a hardware roundup and in other scenarios where it's likely to get bounced around, the case is an absolute must. I'm also not thrilled by the fact that in using this case, you lose the ability to use the Surface Go's built-in stand and its amazing hinge. If you haven't used a late model Surface, the hinge for its built-in stand is amazing. 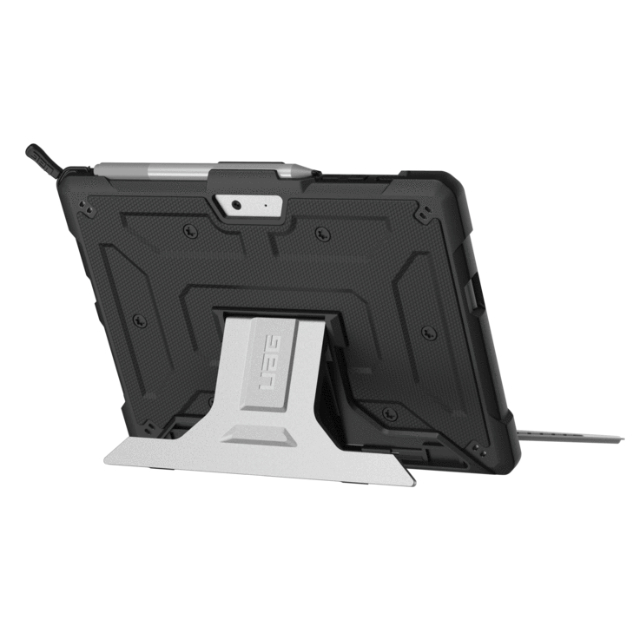 It'll hold the tablet firmly in place so that it can be viewed at almost any angle. The Metropolis case covers the Surface Go's built-in kickstand and forces users to use a stand built into the backside of the case. The stand offers a number of viewing angles, but it's nowhere near as functional as the Surface Go's kickstand. I'm using the case to type this review right now. The viewing angle it provides is fine. But I don't like the idea that the case I'm using keeps me from getting the most out of my expensive wee tablet computer. Still, a loss of viewing angles and a bit of weight is a small price to pay for protecting my considerable hardware investment.